By Veronica Buchanan, Sisters of Charity Archivist and DHS Trustee. SC Archivist Veronica Buchanan and DePaul Freshman student Bre’Ale Jackson. 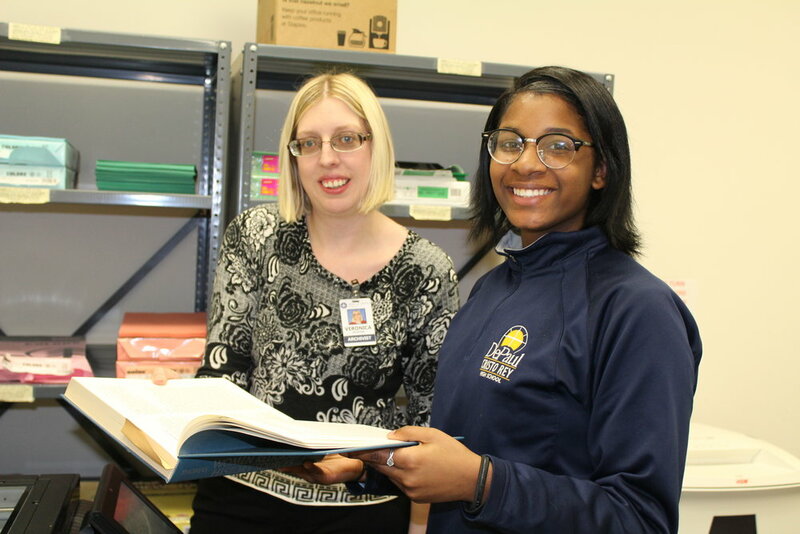 Through a collaboration with our sponsored ministry DePaul Cristo Rey High School’s Corporate Work Study program, the archives has secured two students for the past two school years. Our freshmen students have focused on researching and updating existing records for the Mount Saint Joseph Cemetery in the website www.findagrave.org . With nearly 2000 records for the cemetery already entered, the students are nearing the halfway mark of editing the existing records. In the next year, we anticipate a student will begin the process of creating new records for the Sisters who are currently missing from the system. Most of the corrected records now include photographs of the Sister as well as their legal and religious names. To date, this project is our most used genealogical resource. Our sophomore and junior students’ primary projects are creating EAD (Encoded Archival Description) finding aids in the Ohio Library Network (OhioLINK) digital repository to document the records preserved from hundreds of missions the Community has either founded or staffed since 1852. Mission collections are processed by the archivist and Associate volunteer Kay Jackson; the resulting finding aid is then given to the students digitally and they begin the painstaking efforts of entering the data into a web-based platform to form the online version of the finding aid. To date, over 200 individual collections are represented in OhioLINK, providing researchers and scholars across the globe with a better sense of the resources available in each collection. DePaul Junior student Jordi Vasquez , Class of 2018 and Archives volunteer Joyce Brehm, SC. Finally, in 2017, the archives received an Ohio Historical Records Advisory Board (OHRAB) grant to digitize valuable resources in the collection that speak to the history of the state. Of most interest to genealogical researchers, excerpts from a Civil-War era patient ledger from St. John’s Hospital (now known as Good Samaritan Hospital) are now available to view through Ohio Memory, the digital repository of the Ohio Historical Society. They document soldiers from both the Union and Confederate armies who were transported from the Battle of Shiloh in Tennessee to St. John’s Hospital in downtown Cincinnati. The records include, whenever possible, the name, admittance date, nativity, and affiliation (i.e. Union or “Rebel”) for each soldier. Thanks to the painstaking efforts of Sister Joyce Brehm, a faithful volunteer of the archives, each entry of the ledger that has been digitized now includes a keyword searchable transcription. For more information about the Sisters of Charity of Cincinnati archives or to schedule an appointment to view more materials from our collections, please visit http://srcharitycinti.org/contact.htm.